The Ford Taurus is the Brett Favre of sedans: It used to be one of, if not the best — and we respect that — but it’s getting a bit old. What do you need to know before you buy a Ford Taurus? Don’t worry, we’ll tell you everything right here in the Ultimate Buyer’s Guide. Ford’s former CEO, Alan Mulally, turned Ford Motor Company into a genuine stalwart in the industry. Nearly every vehicle in its lineup is among the best in its class, offering great turbocharged engine options, nice refined interiors, and clean European-esque styling. The sixth generation Taurus, launched as a 2010 model, was one of Mulally’s first major projects and helped set the trend for what became the strong lineup you see today. When compared to its competition in 2010, the Taurus was good. It offered nice clean looks, a good interior, and and decent handling for such a big boat. But five years later, the 2015 model, while still good, may not be at the top of its class anymore. Still, with a new model coming in 2016, it’s worth checking out as there are surely good deals to be had. The sixth generation Taurus launched for the 2010 model with a 264 hp 3.5-liter V6 mated to a 6-speed automatic transmission on the standard car and a potent 365 hp Turbo V6 on the Super High Output (SHO) model. Changes since that 2009 debuted have been pretty significant. 2013 brought a new fascia with an updated grille and revised headlights. The interior was also updated in ‘13 with new tech and more standard features. There was also some movement on the powertrain front in 2013, with a new 2.0-liter turbocharged inline four becoming available, and the base 3.5-liter V6 was tuned to make 25 more ponies for a total of 288 hp. Changes for the 2014 and 2015 model years were minor. Ford offers three strong engines in their Taurus: a 2.0-liter EcoBoost I4, a 3.5-liter naturally aspirated V6, and the SHO-only 3.5L EcoBoost V6. All engines produce plenty of grunt, which is good, as the Taurus weighs two tons. The 3.5-liter is the base engine, and cranks out a healthy 288 horses. The optional 2.0-liter produces only 240 hp, but makes quite a bit of torque at 270 lb-ft.
Then, finally, you’ve got the range-topping EcoBoost V6, which makes a V8-like 365 horsepower — enough to get this large family sedan to 60 in under six seconds. The Taurus’s Fuel economy is not great. Only the two-wheel drive four cylinder turbo model cracks into the 20s in the city and into the 30s on the highway — not surprising considering this car’s heft. The base 3.5-liter does okay in two-wheel drive form, managing 23 MPG combined. 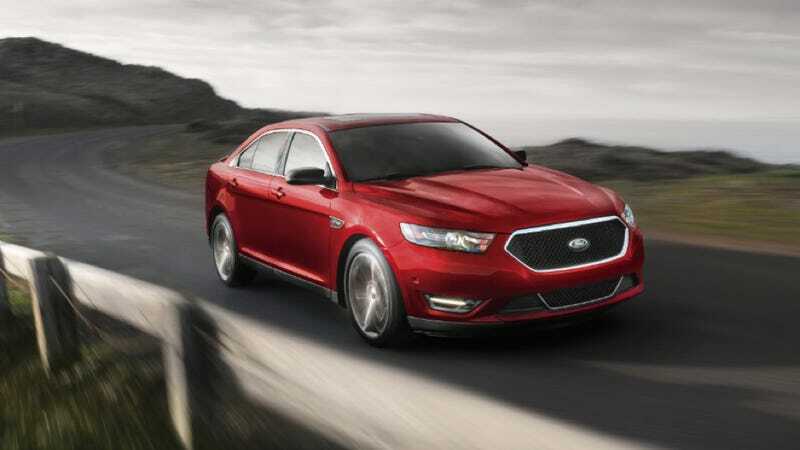 The all-wheel drive Taurus and the all-wheel drive Taurus SHO bring up the rear with combined fuel economy ratings barely over 20. All Tauruses (Tauri?) come with a multi-link rear suspension, MacPherson struts up front, and electric power steering. Front and rear brake rotors are 13.9 inches in diameter, with the SHO getting vented rear discs while the lower trims make do with solid rear rotors. Tauruses come in four different flavors: SE, SEL, Limited, and SHO. Limited: Starts at $34,405. Notable standard features over SEL: 19” wheels, push-button start, heated and cooled front seats, ambient lighting, woodgrain interior trim, memory for driver’s seat, mirrors and pedals, 8” LCD touchscreen with SYNC with MyFord Touch in-car communication system, perforated leather seats, reverse sensing system. Notable options: all-wheel drive ($1,850); 2.0-liter EcoBoost I4 ($995); 301A Group: HD radio, Sony audio system, blind spot warning with cross-traffic alert, auto high beams, rain sensing wipers, heated steering wheel, power rear sunshade, heated rear seats, auto dimming driver’s mirror ($2,150); Driver Assist Package: adaptive cruise control, lane keep assist/departure warning, active park assist ($1,995+301A group); power moonroof ($995); 20”wheels ($695+301A package); navigation ($795). SHO: Starts at $40,220. Notable standard features over Limited: 3.5-liter EcoBoost V6, all-wheel drive, sport tuned suspension, 20” wheels, unique exhaust tips, unique exterior trim, paddle shifters, HID headlamps, perforated leather heated seats with SHO trim, unique pedals, wood/leather wrapped steering wheel. Notable options: 401A package: same as Limited’s 301A group ($2,000); Driver Assist Package: Same as Limited ($1,995+401A group); SHO performance package: performance brakes, sport-tuned suspension, sport-calibrated electric power steering, Track Mode, upgraded engine cooling, unique 20” wheels ($1,300); Active Park Assist ($1,995); power moonroof ($995).